The California vole (Microtus californicus) is a type of vole  which lives throughout much of California and part of southwestern Oregon. It is also known as the California meadow mouse. It averages 172 mm (6.8 in) in length although this length varies greatly between subspecies. The young are born hairless and blind, weighing an average of 2.8 g (0.099 oz). They begin to grow fur within five days of birth, and their eyes open at 9 days, although they are capable of sensing light before this. The young are weaned at around two weeks of age, and have a full set of adult teeth by three weeks. Females reach sexual maturity after as little as three weeks, while males become sexually mature after six weeks. 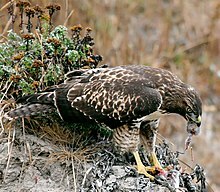 The lifespan is correspondingly short, with individuals living for less than a year, even in the absence of predators. ^ Álvarez-Castañeda, S.T. ; Castro-Arellano, I.; Lacher, T. & Vázquez, E. (2008). "Microtus californicus". IUCN Red List of Threatened Species. Version 2008. International Union for Conservation of Nature. Retrieved 11 June 2009. Database entry includes a brief justification of why this species is of least concern. ^ Wilson, D.E. ; Reeder, D.M., eds. (2005). Mammal Species of the World: A Taxonomic and Geographic Reference (3rd ed.). Johns Hopkins University Press. ISBN 978-0-8018-8221-0. OCLC 62265494. ^ a b B.J. Verts; L.N. Carraway (1998). Land Mammals of Oregon. Berkeley: University of California Press. ^ a b c d e f g h Cudworth, N.L. ; Koprowski, J.L. (2010). 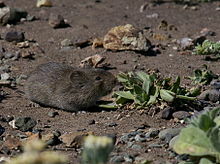 "Microtus californicus (Rodentia: Cricetidae)". Mammalian Species. 42 (1): 230–243. doi: 10.1644/868.1. Archived from the original on 2017-10-22. ^ Heske, E.J. ; Lidicker, W.Z. (1999). Wilson, D.E. ; Ruff, S. (eds.). The Smithsonian Book of North American Mammals. Washington, D.C.: Smithsonian Institution Press. pp. 626–628. ISBN 1-56098-845-2. ^ Batzli, G.O. ; Pitelka, F.A. (1971). "Condition and diet of cycling populations of the California vole, Microtus californicus". Journal of Mammalogy. 52 (1): 141–163. doi: 10.2307/1378438. JSTOR 1378438. ^ Heske, E.J. (1987). "Spatial structuring and dispersal in a high density population of the California vole Microtus californicus". Ecography. 10 (2): 137–148. doi: 10.1111/j.1600-0587.1987.tb00750.x. ^ Stark, H.E. (1963). "Nesting habits of the California vole, Microtus californicus, and microclimate factors affecting its nests". Ecology. 44 (4): 663–669. doi: 10.2307/1933012. JSTOR 1933012. ^ Bell, J.; Bever, J.S. (2006). "Description and significance of the Microtus (Rodentia: Arvicolinae) from the type Irvington fauna, Alameda County, California". Journal of Vertebrate Paleontology. 26 (2): 371–380. doi: 10.1671/0272-4634(2006)26[371:DASOTM]2.0.CO;2.